MARINKA, Ukraine -- It was wet and freezing cold inside: Bare earth floor with a dozen mattresses scattered around it, unfinished tea in an aluminum mug, a few pieces of bread on a plate on top of a dark green wooden box with army ammunition; a bunch of muddy rubber boots by a pile of bags with sand, a soldier’s jacket drying on a nail in dim light. It could be a scene of the soldiers’ life in World War I, but it is modern times. The Ukrainian soldiers in the dugout outside of Krasnohorivka, like those in the trenches a century ago, find themselves endlessly stuck, each side watching the other through binoculars. Inhabitants of the front line towns of Marinka and Krasnohorivka in eastern Ukraine, more than 20,000 people in all, live a grim life without heating and without gas, because it is too dangerous for city services to fix the holes in the pipeline, which stretches above the ground along the war front. Besides, once you fix it, there is a high chance it will be destroyed again. The fear of death locks every door at about 5 p.m.
“Last time I felt safe outside in the evening was before the 3rd of June in 2014,” says Alina Kosse, director of the House of Arts for children. The fighting in eastern Ukraine has intensified this year, and local people can hardly sleep a single night in peace. The truce between Kiev and Moscow is very shaky, the front line constantly moving back and forth, killing civilians and destroying their property in the crossfire. Here in Marinka there is no sign of peace. Every day people disappear from the streets after 4 p.m., as the first sounds of machine guns firing or RPGs exploding echoes through the cityscape and sniper fire comes as if out of nowhere. “They must be Russian professionals shooting at us with super powerful sniper rifles,” Lt. Col. Alexander Pashkevich, told The Daily Beast. Almost every day and night, Ukrainian Armed Forces and Russia-backed rebels of the self-proclaimed Donetsk People’s Republic exchange mortar fire, machine-gun fire or launched grenades in each other’s directions; and both sides report of each other’s truce violations. 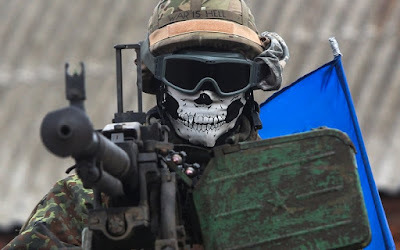 On Wednesday night the Ukraine 14th Brigade units based in Marinka were under fire from a “sabotage group” of about 15 rebels, coming in the dead of the night as close as about 100 meters to the brigade’s headquarters on the outskirts of town. Dozens more rebels backed up the group from the closest entrenched positions, the Ukrainian commander told The Daily Beast. At about 8 p.m. the town of more than 6,000 people, including more than 200 children, was shaken up by RPGs and machine guns, then again a second time at around 10 p.m.
“They have better uniforms than ours; we cannot see them through our night thermal vision optics. Their corrections of fire are more accurate, they must have had better optics on every gun,” Vlad Yakushev, a press officer of the brigade told The Daily Beast after the night of fighting. The 14th Brigade “West” of the Ukrainian Armed Forces has defended nearly 40 kilometer long front line outside of Marinka and Krasnohorivka towns since September. A cruddy Opel given by volunteers and a few armored vehicles represent the only transport the brigade has for thousands of personnel. But the lack of comfort has become the norm, and the soldiers complain about more serious issues, how many months overtime they have served on the frontline. Many of the brigade’s soldiers and officers signed an agreement for one year’s but have been fighting for much longer; and many salaries are unpaid. Such issues are feeding frustration in the units. On Feb. 1, Vlad Yakushev, the same press officer, published a blog on a news website giving a detailed description of the issues in the 14th Brigade. He mentioned that most of the soldiers spending nights fighting never received their 1,000 UAH or $36.86 battle premiums. The next day Yakushev was detained by army officials and kept in detention for three days without his friends knowing where he was. Looking for him, soldiers and journalists raised an outcry, made calls, organized a flash mob on social networks to demand his release. “Even if this war lasts for five more years, soldiers should know exactly how long they are supposed to spend on the front; they should receive the money promised by the state,” Yakushev told The Daily Beast. Five more years of war in Ukraine? To locals it already feels like a decade. Drive along the most dangerous streets in Marinka—Telmana, Matrosova, Okrtiabrskaya, Lenina—and you will see ruined buildings, fences and gates riddled with bullets, the history of the war. The road to the nearby Krasnohorivka is the saddest picture. Almost every building—factories, farms, warehouses, apartment buildings and private homes have signs of destruction. “We do not have money to reconstruct this city’s ruined buildings,” the head of the Krasnohorivka administration, Ihor Robochiy, told The Daily Beast. Among the worst issues the city manager mentioned was Ukraine losing the propaganda war in the region. “Our citizens in towns along the front cannot watch any of the Ukrainian television channels, only separatist channels aired from Donetsk, and Russian channels,” he said. Back in Marinka children were gathering at the regional House of Arts to work on their creative projects. Some took classes for dancing or singing, some knitted toys, painted or studied music—all classes were free for about 600 children living in several neighboring towns and villages. Parents chatted in the hallway, while kids studied, and although both walls and windows were perforated by bullets and pocked by shrapnel after multiple artillery attacks, the atmosphere was homey. The Marinka community was coming together. Maybe the war was almost over? “No", the war goes on, said nine-year-old Katia, shaking her head. She looked serious, almost like a careworn adult. Nobody in Marinka can tell when the disaster will be over.